1) The first author of the paper, Volker Böder, died 31 August 2012 in a tragic ship accident on duty and we would like to remember him on the remarkable research he has done over the years with the publishing of this article. Volker Boeder was Vice-Chair of Commission 4, Chair of Working Group 4.3 “Multi-Sensor Systems for Hydrographic Applications”, and was a very active member of Commission 4. Among other things he worked on a publication related to the development of technical guidelines for sensor integration (best practises). Volker Böder shall be very much missed both as a colleague and a friend. Due to special conditions and requirements in the Port of Hamburg and along the river Elbe, which is the most essential entrance for the economy of Hamburg, the monitoring of erosion and sedimentation in the Port but also the monitoring and documentation of port facilities are of major interest. These tasks require a multi sensor system, which is able to measure simultaneously above and below water. 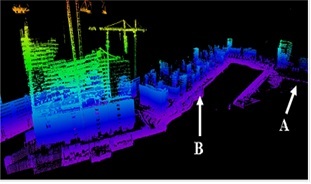 Below water multi beam echo sounders in mobile mapping systems are in use to monitor quay walls and sediments. 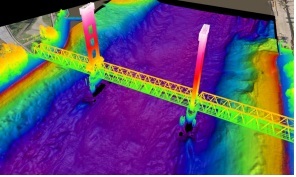 In general static terrestrial surveying methods or LIDAR measurements generate the necessary information above the waterline. Both methods are limited for various reasons. Experiences of the integration of the terrestrial laser scanner Riegl VZ-400 into the mobile hydrographical multi sensor system will be presented in this paper. The pilot study was carried out with the terrestrial laser scanner Riegl VZ-400 of the HafenCity University Hamburg (HCU), which has been installed on the survey vessel “Deepenschriewer III” from the Hamburg Port Authority, and on board the survey vessel Level-A from the HCU. For testing the sensor integration selected harbour areas in Hamburg were scanned to demonstrate the performance of the system. To verify the accuracy of the kinematic laser scanning system on the ship some reference data has been additionally scanned with static/terrestrial laser scanning. The system integration and test procedures including first results are described in this paper. Three-dimensional geodata are digital information to which a specific spatial location can be assigned on the earth's surface or in the water. These geodata provide a substantial part of the knowledge existing in the modern information and communication society, and which is increasingly needed on all levels in administration, economy and science, and by individual citizens. They are the basis of planning-related actions and their availability is a requirement for location and investment decisions. This leads to an increasing need for geodata which meets high requirements such as efficient data collection (up-to-date and economical data) and extensive availability (fast, simple, complete, area-covering and large scale). Therefore, mobile sensor systems (or MMS - Mobile Mapping Systems) offer an optimal solution for efficient 3D data acquisition in the air (airplane, helicopter), on the ground (vehicle) and on the water (ship). In this contribution, a mobile multi sensor system is installed on a survey vessel with which 3D geodata can be simultaneously acquired above and below water level. 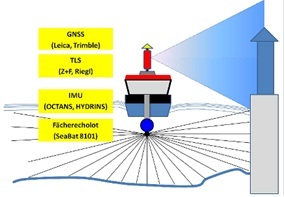 However, this paper focuses on the integration of a terrestrial laser scanner (TLS) on a ship-based multi sensor system, which is equipped with navigational and hydrographical sensors. Based on the new developed survey platform different investigations have been carried out in a co-operation between the HafenCity University Hamburg (HCU), the Northern Institute of Advanced Hydrographics (NIAH) GmbH, and the Hamburg Port Authority (HPA). For this pilot study the terrestrial laser scanner Riegl VZ-400 was used on the survey vessel “Deepenschriewer III” of HPA, in order to test the system in typical HPA applications. Some initial experiences with the integration of a terrestrial laser scanner into the mobile hydrographic multi sensor system on a ship have already been described by Boeder et al. (2010). Modern multi sensor systems on a ship can be equipped as follows: terrestrial laser scanner for 3D data acquisition above water, multi beam echo sounder to map seabed structures / topography under water, GNSS for kinematic positioning of the laser scanner and echo sounder, and inertial measurement unit (IMU) for determination of the vessels orientation (roll, pitch, heading) and for supporting and improving the GNSS accuracy. The spatial vectors between the individual sensor systems are determined very precisely in a ship coordinate system by geodetic measuring procedures in order to transform all measurements into a super-ordinate coordinate system. 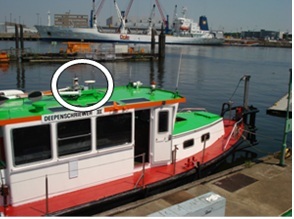 The multi sensor system on board the survey vessel “Level-A” (HCU) and “Deepenschriewer III” (HPA) are similarly designed. The GNSS correction data for the generation of precise real-time positioning (networking solution) is provided by an external service (“Level-A”: SAPOS, “Deepenschriewer III”: Trimble VRS-NOW). Both systems use an IMU from IXSEA. The HCU uses the IXSEA OCTANS III. The HPA’s system (IXSEA HYDRINS) generates a more precise course angle and supports a NMEA-positioning input. The data fusion is accomplished in both systems using the acquisition and processing software QINSy from the company QPS (Zeist, the Netherlands). Further information on the hydrographical multi sensor system of the HCU (HCU HMSS) is summarised in Boeder (2010). Fig. 1 shows an overview of the on board sensors and the survey vessel “Deepenschriewer III”. The “Deepenschriewer III” is a steel ship, which is used by Hamburg Port Authority (HPA) for hydrographic measurements in the Port of Hamburg and on the river Elbe. In particular the monitoring of the water depth as well as the bathymetry of the waters regarding geomorphologic changes and the detection of obstacles are major tasks for this survey platform. With a length of 17.2m, a width of 4.9m and a draught of 1.4m the ship is well suited to almost all surveying applications in the harbour. The positioning on board is carried out by GNSS systems in real time using the above mentioned data correction services. In order to achieve a high availability of precise positioning as many satellites as possible must be included in the measurements. On board the “Deepenschriewer III” a Trimble SPS851H GNSS receiver with Zephyr antenna is operating. 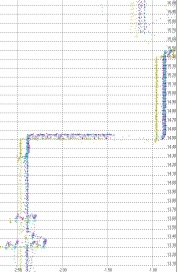 The correction data is provided by the service Trimble VRS-NOW. The measuring rate is up to 20Hz; a PPS output for the purpose of time synchronisation is available. The accuracies of the Trimble VRS-NOW correction data service can be estimated to 1-2cm in the 3D point position. Real time kinematic (RTK) positioning data are integrated into the IXSEA HYDRINS solution using data from the inertial sensor. The accuracy of the heading is given with 0.034° in Hamburg (0.02° secant (φ)), roll and pitch with 0.01°. According to the manufacturer’s specification the integrated positioning is more precise than the available GNSS solution by a factor of three. The HYDRINS uses a Kalman filter to combine the noisy GNSS-data and the long term drifting of the IMU to provide a smooth and stabile position. However, this statement requires an independent investigation. The combined solution is then transferred in real time via RS232 or LAN to the hydrographic processing software QINSy for the integration of all sensors. On the “Level-A” the determination of orientation angles can be made additionally with the support of an array consisting of four GNSS antennas (Boeder 2009). The terrestrial laser scanner Riegl VZ-400 uses near-infrared light with a beam divergence of 0.3 mrad (0.017°), which corresponds to one footprint with a diameter of 30mm at 100m according to the manufacturer’s specification. The vertical field of view of the VZ-400 ranges from +60° to -40°, which gives a viewing angle of 100° for a 360° scan. Using these angle values a vertical measuring range of 17.3m over and 8.4m below the instrument horizon at a distance of 10m can be determined. However, an additional tilting mount can support other elevations of the scanning system. The distance between two scan lines is, at minimum, 4mm in horizontal and vertical directions at a range of 100m. For the distance measurements a standard deviation of 5mm at 100m range is specified using Riegl´s test conditions. The resolution of horizontal and vertical angles is given as 0.0005°, which corresponds to a lateral deviation of 4mm at a range of 500m. Based on this information the standard deviation of each coordinate component can be estimated with a higher precision than 1cm at a range of 100m. In the Long Range Mode the maximum distance is 500m for good natural reflectors (reflectivity ρ ≥ 80%) and 160m for reflectors with ρ ≥ 10%. The effective measurement rate is 42,000 measurements per second with a pulse repetition rate (PRR) of 100kHz, while this can be speeded up by a factor of three in the High Speed Mode (125.000 measurements/second, PRR of 300kHz). Here, the operating range is only 300m, about 60% of the Long Range Mode using natural reflectors with a reflectivity ρ ≥ 80% and 100m with ρ ≥ 10%. The scanning speed is indicated as 3 to 120 lines per second in the vertical. As a consequence an interval of 3cm for vertical lines can be achieved with a speed of the boat of 3m/s using a scanning speed of 100 lines/s. The data transfer on board and the time synchronization is solved similar to the IMAGER 5006i (Boeder 2010). The integration of the Riegl VZ-400 into the software QINSy had been established without any problems using the special developed Riegl driver. The multi beam echo sounder Reson SeaBat 8101 measures distances in the water with an acoustic frequency of 240kHz. The beam forming mechanism generates signals from the received energy with an opening angle of 1.5° in both the sensor direction and perpendicular to it, corresponding to a footprint with a diameter of 2.61m at a water depth of 100m. However, for coastal and riverside applications, which shall be connected to data from terrestrial laser scanners, depths of approximately 10-20m can be expected. Therefore, the beam diameter is 26cm at a depth of 10m. Due to a system expansion the opening angle of the entire multi beam echo sounder (SeaBat 8101) on the “Level-A” is 210° crosswise and 1.5° lengthwise to the ship’s longitudinal axis. On board of the “Deepenschriewer III” the system is equipped with 101 beams as the standard option using an opening angle of 150°. The maximum range for measurements is 300m using the available SeaBat 8101. According to the manufacturer’s specifications the resolution of the depth measurements is given to 1.25cm. The accuracy of a depth measurement essentially depends on the accuracy of the determination of temperature and salinity of the water in the different sediment layers. In water depths of 10m accuracies of better than 10cm are attainable, but rarely better than 5cm. The data can be processed in different post-processing programs, usually the program QINSy is used on board of the “Level-A” using a LAN interface for data transfer to the computer.Despite apparently worse characteristics concerning point measurements in comparison to laser scanners multi beam echo sounder of good quality are significantly more expensive than good laser scanners. Here, the less favourable conditions of the underwater measurements with hydro-acoustic techniques are considered. In Fig. 2 the terrestrial laser scanners Riegl VZ-400 and the multi beam echo sounder Reson SeaBat 8101 are presented, while in Fig. 3 the system installation on board the ”Deepenschriewer III” are illustrated. Fig. 3 shows the location and the components of the multi sensor system on the roof of the “Deepenschriewer III”. GNSS antenna, IMU and TLS were installed on a plate along the ship’s axis with a distance of 30cm between each sensor. The close proximity of each sensor reduces possible error influences from the geodetic sensor determination and from the fusion of the measuring data. The uncertainty computation for the echo sounding part is similar to the laser scanning part of a hydrographic mobile mapping system. They differ only in their error sources and error equations and finally in their magnitudes if both are scaled to 95% confidence level as shown in Figure 4. 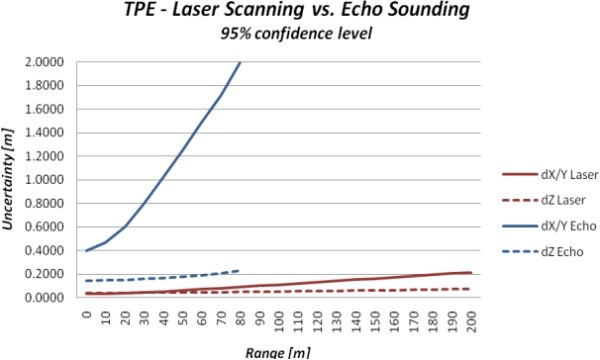 Figure 4: Range depending uncertainty of coordinates (total propagated error, TPE) of a laser scanning system in comparison with a multi beam echo sounding system (95% confidence level). (Thies 2011). To improve the horizontal uncertainty of the echo sounding system significantly it is necessary to use a high resolution, high frequency multi beam echo sounder in combination with an IMU. The vertical uncertainty of such a system is mostly influenced by the accuracy of sound speed determination which is not only needed for the beam forming process but also for the ray tracing of the echo beams. The following presented investigations are based on the first measurements in the Grasbrookhafen in the HafenCity of Hamburg on July, 16th, 2010. The scanning area is illustrated in Fig. 5 in an outdated aerial photograph of Google Earth. The harbour basin is about 450m long in east-west and 60m to 110m broad in north-south direction. With the exception of the old dock warehouse A of the future Hamburg Philharmonic Hall no buildings shown on the aerial photograph remained at the time of survey. However, the northern and the eastern area of the Grasbrookhafen are today already fully developed and in use. The right image in Fig. 5 shows a perspective view of the scanned data in the Grasbrookhafen. 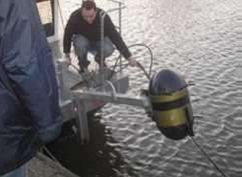 In the first investigations the “Deepenschriewer III” drove at about 20m distance from the quay wall, in order to be able to scan the dock plants up to the water line. Three profiles were successively scanned and analysed later in the office. Two profiles 1 and 3 begin on the northern bank from west to east and conclude with east-west profile on the southern bank. Profile 2 starts on the northern bank from west to east and ends on the southern bank with an east west profile. 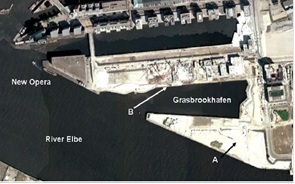 Figure 5: Outdated aerial photograph of the Grasbrookhafens (source: Google Earth) in Hamburg HafenCity (left) and perspective view of the scanned data (right). First accuracy analyses could be completed both at the back-positioned house front and at the quay wall (Fig. 6), which showed comparable results in each case (7cm in XY, 4cm in Z). The coordinates of the deviating profile were continuously further distance from the ship, thus it can be assumed that systematic effects occur in this profile. indicating the differences in X, Y and Z. 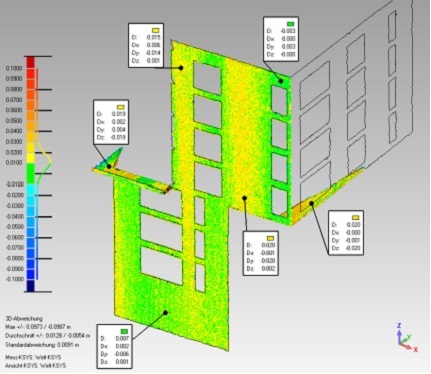 Further precision statements have been accomplished by analysing surfaces and linear structures in different profiles. 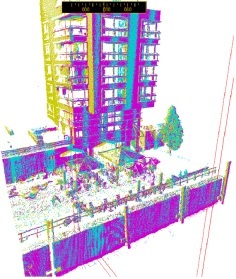 The comparison to reference data which was acquired by static terrestrial laser scanning with the Riegl VZ-400 on August 13th, 2010 allows more precise statements about the accuracy of mobile scanning. The aim of the accuracy analysis is not to determine deviations between discrete points in mobile and reference data but to give an area based overview of 3D differences. For this reason four objects were selected out of the whole dataset which are presented in Figure 7. The data set has been computed with different processing methods and their inherent properties, which are summarized below. The results between two profiles are analysed in details in Thies (2011). The best fitting solution of reference and mobile data was achieved with the Riegl software RiPROCESS Recalibration. Figure 8 shows the results of the system when all angular misalignments are determined precisely. The differences are distributed normally which is indicated by the histogram on the left hand side of the figure. However, there is still a bias in Y direction of approx. 1 cm but this is just the accuracy of the positioning system. The vertical deviations were reduced to ±2cm at maximum which corresponds to the accuracy of the IMU height. Nevertheless, the deviations oscillate around zero which still indicates a slight dynamic effect in the motion data. Determination of the trim behaviour (squat and settlement) of ship. 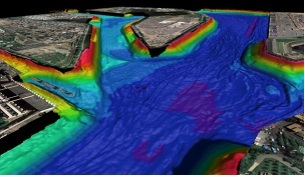 Figure 9 shows the combination of 3D bathymetry combined with orthophotos and results from a mobile laser scanning of a harbour bridge. The data can be used in a harbour information system to derive vertical clearance information under the bridge for ship manoeuvrability. Figure 10 shows a modelled change analysis of a part of an old quay wall. Deformations could be monitored by continuous surveying of endangered objects with mobile laser scanning. These investigations into the use of a terrestrial laser scanning system on board of a surveying vessel in Hamburg show that data acquisition by such systems can be integrated into the hydrographic multi sensor systems (HMSS) both in post-processing mode and in real-time. The high speed of data acquisition, the abundance of information (3D coordinates, reflecting characteristics) and the accuracy of the acquired point clouds within the centimetre range offer good requirements for the use of this new technology for many applications at and on the water. For the investigations at HCU and NIAH the software QINSy for data acquisition plays a crucial key role for the integration of terrestrial laser scanners in real-time. The integration of the Riegl VZ-400 could be successfully accomplished. In addition the pilot study showed that the pure accuracy of the inertial measurement unit significantly affects the accuracy and quality of the kinematic laser scanning data. Finally, the laser scanner Riegl VZ-400 used on board the surveying ship has a clear advantage due to its technical specifications concerning scanning range, accuracy and resolution, making the use of this laser scanner very reasonable economically. By system integration and extension of terrestrial laser scanners on board surveying vessels the range of applications can be increased. Boeder, V., 2009. Untersuchung von Lagewinkelsensoren. Beiträge zum 89. DVW-Seminar Hydrographie – Neue Methoden von der Erfassung zum Produkt, Hamburg. Schriftenreihe des DVW, Band 58, Wissner-Verlag, Augsburg, pp. 19-30. Boeder, V., 2010. HCU-HMSS: A Multi Sensor System in Hydrographic Applications. 2nd International Conference on Machine Control & Guidance, Schulze-Lammers, Kuhlmann (Eds. ), Bonn, March 9-11, pp. 65-74. Boeder V., Kersten Th., Hesse C, Thies, Th., Sauer, A., 2010. Initial Experience with the Integration of a Terrestrial Laser Scanner into the Mobile Hydrographic Multi Sensor System on a Ship. ISPRS Istanbul Workshop 2010 on Modeling of optical airborne and spaceborne Sensors, WG I/4, Oct. 11-13, IAPRS Vol. XXXVIII, part 1/W17. 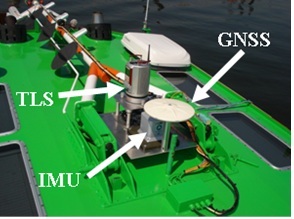 Thies, T. (2011): A Vessel-Based Mobile Mapping System – From Sensor Integration to Multipurpose Products. Master Thesis, HafenCity University Hamburg, 2011 (not published). Volker Böder graduated in geodesy from the University Hannover in 1994. His doctoral thesis from 2002 is about precise positioning and attitude determination in marine applications. He received his Assessor Degree from the Government of the Federal State of Lower Saxonia in 2005. From 2005 he was professor for practical geodesy and hydrography at the HafenCity University, Hamburg until his tragic accident. Thomas P. Kersten graduated in Geodesy from the University of Hanover in 1988. From 1989 – 1995 he was a research and teaching assistant at the Swiss Federal Institute of Technology (ETH Zurich), Institute for Geodesy and Photogrammetry, and from 1995 – 2000 Head of Photogrammetry Department at Swissphoto Ltd. Since 2001 he is Professor for Photogrammetry & Laser Scanning at the Hamburg University of Applied Sciences, and from 2006 he holds the same position at the HafenCity University Hamburg. Thomas Thies graduated in Geomatics in 2007 and received his M.Sc. 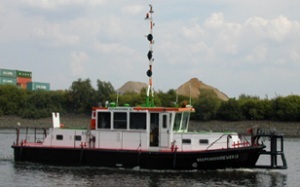 Hydrography (CAT A) in 2011 from the HafenCity University Hamburg. Since 2007 he is working as a Hydrographic Survey Engineer at the Hydrographic Survey Department of the Hamburg Port Authority. Arne Sauer graduated in Geomatics in 2007. Since 2006 he is working as a Hydrographic Survey Engineer at the Northern Institute of Advanced Hydrographics at the HafenCity University Hamburg.